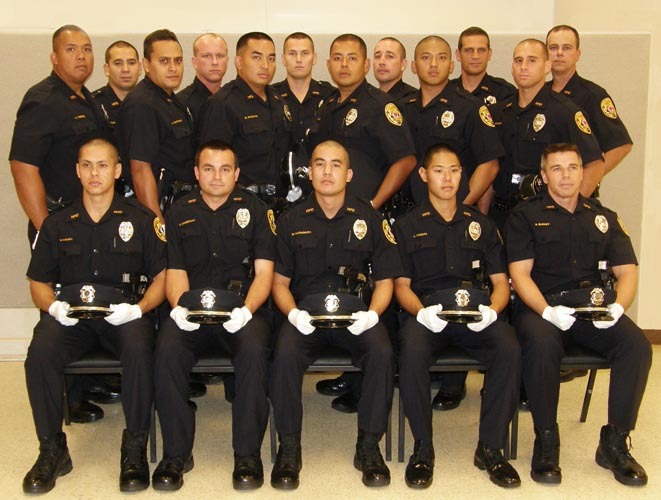 The 77th Recruit Class (left to right): Seated: Bradden T. Kimura, Danton K. Zimmermann, Michael W. Matsumura, Aron M. M. Tomota, Steven J. Burkey Standing: Andrew D. Gabriel, Shea L. A. Nactor, Michael K. Rutkowski, Brett P. Winther, Blake M. Ragocos, Gabriel D. Wilson, Adrian C. Ruiz, Joshua D. Grotkin, Aaron P. Abalos, Paul R. Endean, Kaeo J. Drummondo, Cory A. Gray. 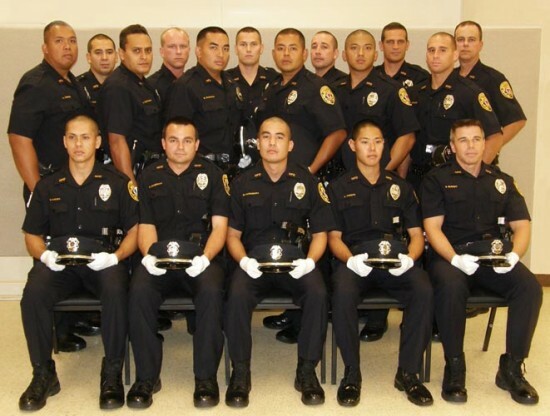 The 17 members of the Hawai’i Police Department’s 77th Recruit Class were recognized Thursday (January 7) during ceremonies held at the Hilo Hawaiian Hotel. The police recruits, who just completed six months of intensive training, will now undergo four months of on-the-job field training with veteran police officers before they are qualified to work alone. Police Commissioner Anita Politano Steckel encouraged the new officers to hold on to their enthusiasm and to keep learning. “Nothing is routine,” she said. Mayor Billy Kenoi told the recruits that because of their training, they now have expertise in police work. “Thanks for your commitment, thanks for your dedication and thanks for your service to the County of Hawai’i,” he said. Three of the recruits received special recognition for their excellence in training. They were Burkey, who excelled in physical fitness training, Kaeo J. Drummondo, who excelled in academic training, and Michael W. Matsumura, who excelled in firearms training. The other recruits recognized were Vice President Aaron P. Abalos, Secretary-Treasurer Aron M. M. Tomota, Paul R. Endean, Andrew D. Gabriel, Cory A. Gray, Joshua D. Grotkin, Bradden T. Kimura, Shea L. A. Nactor, Blake M. Ragocos, Adrian C. Ruiz, Michael K. Rutkowski, Gabriel D. Wilson, Brett P. Winther and Danton K. Zimmermann.